Blindspotting is a new crime-drama from Hamilton actor Daveed Diggs and newcomer Rafael Casal. Set in the gritty streets of Oakland, this story follows an ex-con named Collin (Diggs) who works as a mover with his white best friend Miles (Casal), who tries way too hard to be street. After witnessing an incident that he probably should not have witnessed, Collin struggles to survive the remainder of his probation or go back to jail. I knew nothing about Blindspotting outside of a trailer but was still excited for it because it is one of several movies released this year that takes place in Oakland. Sorry to Bother You currently stands as my favorite of these movies and although Blindspotting does not quite dethrone that film, it is still one that I would absolutely recommend. One major element that Blindspotting surprised me with were the technical aspects. Even though I loved the subtle direction of Sorry to Bother You, first-time director Carlos López Estrada provides more energetic direction here, which I also loved. The film’s reliance on camera movements, editing, framing, and so on all fit with the story that Estrada and company are trying to tell. 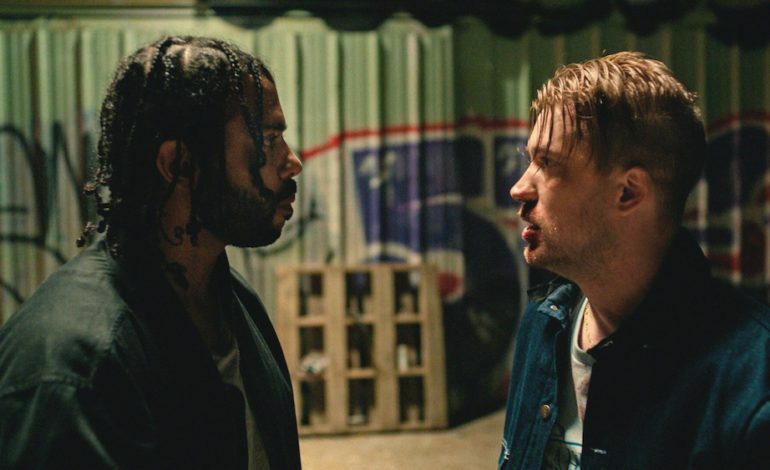 More importantly, Blindspotting portrays Oakland as more than simply a place. The film is depicted with such nuance and sincerity that it is basically a character all on its own. That is one place where Blindspotting excels over Sorry to Bother You even though I adore both portrayals of Oakland. Similarly, the music in Blindspotting fits with its urban setting. Songs from classic Bay Area rappers such as Mac Dre, E-40, and Too $hort appear on the soundtrack to give this film some much-needed authenticity. Diggs and Casal also provide their own rhymes inside and outside of the world and their rapping usually works in context. Unsurprisingly, Blindspotting also features of two of the year’s best lead performances. Diggs proves how much of a leading man he is with his sympathetic performance as the film’s protagonist. Although Collin is flawed, we as an audience can relate to his struggle and want him to survive his probation. Diggs’s sheer talent as both an actor and a rapper alone makes me more interested in his future endeavors. Casal, however, is the film’s clear standout as a character who is not usually shown in media yet still feels way too real. Moreover, Miles will often act reckless, but his actions make more sense as the film progresses. In fact, I can see Oscar consideration for both performances. Furthermore, every character in here feels real. Some make stupid decisions but they fit those personalities. One character in particular was more dynamic than I initially thought. For that reason, all the supporting actors make the most out of what little time they have on-screen. The screenplay of Blindspotting is not perfect but that does not mean it is not great. Diggs and Casal co-wrote this film for over ten years but that that does not stop it from feeling any less relevant. The actor/writer duo takes this generic “black people struggle” premise and breaths new life into it. They tackle familiar sociopolitical issues such as gentrification, media, and police brutality in ways that do not feel ham fisted or disrespectful. Several scenes even appear as scary because they feel so real; one of which is up there with Mission: Impossible – Fallout as the most intense climax of 2018. Unfortunately, Blindspotting is not without flaws, but they are so small that they may disappear on repeat viewings. Outside of one or two moments, the humor never blew me away; it is not bad but it was not quite my cup of tea; but, then again humor is subjective. The ending was also somewhat unsatisfying. That could have been the filmmakers’ intention and there may be a detail that I am missing, but that last scene could have given me some conclusiveness considering how jaw dropping the previous scene was. Blindspotting is a much-needed big break for many people involved. Outside of some issues, clever execution and terrific performances elevate an average premise. Everyone should see it especially those who care about the talent involved or the issues mentioned.